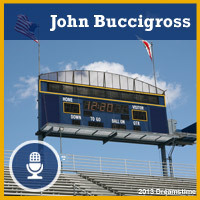 Hear ESPN anchor and writer John Buccisgross discuss the important lessons of youth sports. Expect your players to think. They are not robots. Part of your role is teaching them to think on the field so that they are better thinkers off the field. Asking rather than telling is a good way to get them to think: "What might you have done on that play?" What they say may surprise you. While we’d all love to have a lineup full of clutch, power-hitters, that isn’t always the case. Hitting can go on vacation, and when it does, you’ve still got to score runs to win games. Here’s your plan for when that happens. The next time your team is struggling offensively, whether it’s 1 game or 1 season, make sure you know how to score runs anyway. Own the Zone – Before you can score runs you’ve got to get on base, and if you can’t hit, whether it’s for the entire season or just for this game, your team must still get on base to win. That’s going to come down to owning the strike zone so your batters swing only at strikes and let the balls go by. Drawing walks is an art that requires NO action! Think about that for a minute – one of the best ways to put pressure on the opposing pitcher and team is to NOT do anything; meaning that in order to draw a walk your players do not swing. Your players learn to “own” the strike zone by swinging only at pitches within the strike zone and letting pitches outside the zone – balls – go by. This takes practice, knowledge and discipline, but it’s very possible to learn, and it’s a deadly skill when your entire lineup only swings at strikes. Walks put pressure on the pitcher which then puts pressure on the opposing team – all this by training (which is VERY different than simply talking about this) your players to swing at pitches in the strike zone and NOT swing at pitches that are balls. Take Chances – If your team can’t hit, and you’re relying on walks to get on base, then it’s going to take 4 walks to score a run….all before the other team gets 3 outs. As plans go, that’s not a very good one, so you’re going to have to take chances as a coach and make things happen. You can do this by being aggressive on balls put in play and having your baserunners take multiple bases. You’re going to have to be aggressive in the third base coaching box waving runners home on most balls hit into the outfield since you won’t be able to count on back-to-back hits. Or stealing your runners to second base, or calling for Hit & Runs or Runs & Hits. If you get runners on 3rd base you’ll have to take chances by squeezing players in, or calling a groundball go! (also called angle-down). You might also call this same play with runners on 1st & 2nd . When you’re at the disadvantage, which you are if your team cannot hit, then you’ve got to take chances in order to create runs. You don’t have anything to lose – except the game, so give it a try…often! Take What They’ll Give You – This is one of the easiest ways to score from 2nd, and yet not enough baserunners do it. The farther the defensive player actually covering the base is from the actual base, the longer it will take her to get there – so the longer the lead your runner should take. Too many runners take the same lead no matter where the defensive player (or players) is playing. When your runner gets to 2nd, you’re a basehit away from a run, so try to score that run on your lead-off by taking as much of a lead-off as the defense will give you based on their position. Here's a concept - make friends with the umpire! Click here to listen to Deb Hartwig explain. Watch a youth soccer coach introduce ROOTS to her team. Teach your athletes to respect the game by teaching them abouut how to Honor The Game. Honoring the game means respecting the Rules, the Officials, our Opponents, our Teammates, and ourSelves. ROOTS. 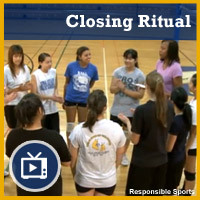 Watch a youth volleyball coach discuss her team's closing ritual. Use a "closing ritual" to signal the end of practice. We stay focused until after the closing ritual! This also helps parents know when practice is over and it's OK to approach their child.